iTQi Superior Taste Award - 3 Golden Stars. The grocer's top campaign awards 2016. World dairy innovation awards 2015. 100% natural ingredients. More milk. Less cream. Less air. Lighter. Smoother. Gluten free. OGM free. Only 7 ingredients. Free from artificial substances. Suitable for vegetarians.We use the finest variety of Sicilian Pistacchio from Bronte for a clean and delicate flavour. 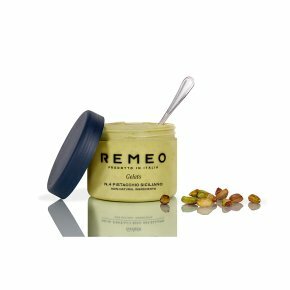 By carefully blending the Pistacchio paste with high-quality fresh milk from a farm in North of Italy, we deliver a rich and indulgent treat with a creamy texture and delicate perfume. Superior Taste Award Winner & Great Taste Award Winner. Only 7 ingredients. Allow to stand at room temperature for 10-15 minutes to reach best taste and consistency.